Alfred McCroskey and his wife began as short-term missionaries in a very foreign land. Nineteen years later, they have "planted" one thousand churches in the Soviet Union. How did this miracle occur? McCroskey believed the Lord was telling him to plant the churches-especially in towns and villages where there was no church at all. McCroskey, his wife Jean & other short-termers heeded the call, with miraculous results. 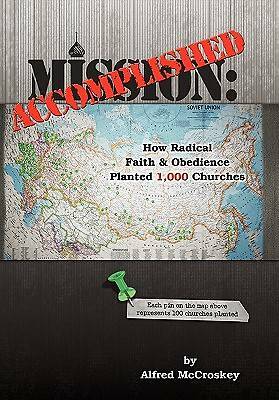 Mission Accomplished is the story of a divine assignment nineteen years in the making. Just as Noah was ridiculed for his building of the ark, the McCroskey family was scoffed at, laughed at, and even resented for their work in the Soviet Union. However, they knew the word of man had no power over the Word of God. Radical faith and obedience were called for and they responded positively. This is the journey of two modern-day pioneer missionaries. It is proof that ordinary Christians can do more than they, or anyone else, thinks possible through the denial of self, taking up of the cross and following Jesus. It is the story of the McCroskey family, but it is a story that could be yours, as well. What "impossible dream" does God have in store for you? Through simple faith and obedience, you might just find out.